Last year was my best year for eating outstanding food. I have been lucky to eat at some of the best restaurants in Britain and the world. Here is a list of the highs and lows of my excellent weight gaining year. Let’s start with the brilliant welcome at L’Enclume, with what I can only describe as a crazy Frenchman jiving on the spot and welcoming me like I was his long lost brother. He was so friendly I thought I was being rude for not remembering him. The service at L’Enclume was brilliant and matched the stunning food and setting. Maaemo also gave us a great welcome. While we were wandering around taking pictures outside, a waiter ushered us in from the cold and showed us to our table. They then spent the rest of the meal maintaining this brilliant service. The chefs bring the food to the table. And another thing I also liked was the chef cooking in his own restaurant. Unfortunately it’s a rare sight in restaurants today. Only six of the restaurants we visited this year had the named chef/owners cooking, or at least in the building. Now let’s move on to the not-so-welcome. We were on time for our table and not early at The French. They asked us to wait and have a drink outside. They then let 4 tables sit down before us while we sat in an uncomfortable seating area. When I was ‘allowed’ into the restaurant they tried to sit me on a table that half overlapped the restaurant exit. I pointed to a nicer table and asked if I could sit there. I was told ‘no, it wasn’t possible because it was for someone else’s birthday’. I was unwilling to take the worst table I have ever been offered and I said I was leaving. At which point I was told to wait. After a lot of talking between themselves, they moved us to the table we had originally asked for. I still feel guilty for the poor person who had to spend their birthday on the awful table half blocking the exit. I am going to start with the worst seat in the house, which is the French. The Beehive also tried to sit us right next to the toilets. And when I say next to the toilets, I mean right next to and not near. When I asked if we could sit in the restaurant area, I was stung by the reply; “It was for people who had booked”. This I had done several weeks before. Some of the best tables I have had are at restaurants that don’t seem to have any bad ones. Man behind the Curtain wins ‘best seat in the house’ hands down. All the tables are well spaced out, where other places would try to squash in another five tables. Another plus was my table had a Ducati motorbike behind it. I used to ride and still love motorbikes, so this was right up my street. My wife thought I was gazing lovingly at her all night until she realised what was over her shoulder. Osteria Mozza was an odd one. I have experienced the closest bunched tables I have ever seen, to one of the best seats ever. I had seen this restaurant on Netflix’ Chef’s table and wanted to sit at the Mozzarella Bar. Luckily, they said ‘yes’ when I asked if there were seats at the bar. I spent the evening watching chefs producing some of the best, if not the finest, Italian food I have ever eaten. Any Questions With The Menu? Maybe it was the year that menus changed? Apart from Atelier Crenn and Man Behind the Curtain. At Atelier Crenn the menu was a poem and did not mention any of the ingredients or dishes themselves, only clues. Being fairly dim, we couldn’t even work it out once the dish arrived! Man behind the Curtain listed all the dishes that the restaurant serves but only serves some of them. You couldn’t choose from all dishes on the menu because they are not on that night. But I can forgive both restaurants as the food was brilliant, maybe I am just old fashioned? 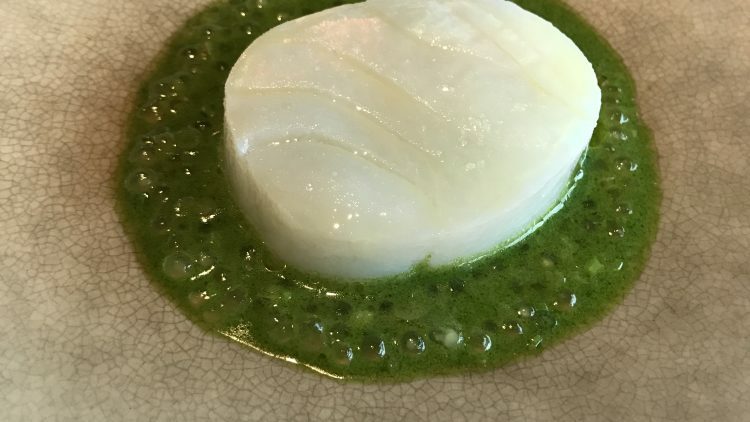 The sublime is everything about Maaemo and L’Enclume. Other highlights include cellophane wrapped bar snacks, where you eat the whole lot including the wrapping. This set the tone for the evening. I was sitting in Bazaar Meats, looking at the chef behind the grill cooking the best steak I have ever had. 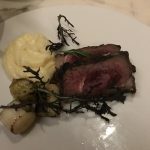 The steak was so good it has changed the way I cook them, even some chefs question the way I cook them now. (you will have to read another one of my blogs to find out how). This shows the importance of being able to change as a chef, sometimes we get caught up in our own arrogance. Maybe I am the one being arrogant, but who cares I am the one eating great steak. The veal dish I had at Osteria Mozza, was simple but brilliant. 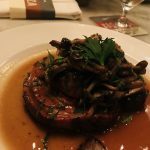 It was rolled veal belly cooked in an amazing sauce and topped with wild mushrooms. It was one of the nicest meals I’ve ever tasted and I doubt I would be able to recreate it. Now let’s talk about the ridiculous. I went to a restaurant were the chef has a reputation for doing the best chips, only to be served frozen chips. Another restaurant wanted a £20 supplement for a dessert because it had been featured on Great British Menu. There were no expensive ingredients in this dish. It was an opportunity to overcharge customers that had come to the restaurant because it was on a TV programme. 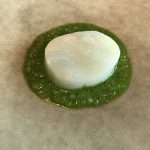 ‘Lightly salted cod from the North with whey and parsley root’. Again I loved L,Enclume. They had many great dishes and ‘Anvil sweet cicely lemon thyme’ stands out. The steak I had at Bazaar Meats by Jose Andres, had a side dish of the best pomme puree (posh for mashed potatoes). Most meat-lovers have memories of their best ever steak and this is mine. I had a scallop dish at The Kitchin by Tom Kitchin. It was baked in the shell with a white wine butter sauce, and wrapped in pastry. This may sound simple, but the scallop and the sauce were awesome. To finish it off I had some lovely pastry lightly flavoured with what had been used to seal it. To finish my top 5 it has to be the veal I ate at Osteria Mozza. I have already raved about this dish, so I am not going to go on about it again. 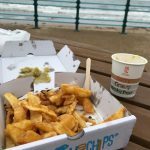 the best chips I have had from a fish & chip shop, the curry sauce was also brilliant. I was here because, many years before my wife’s Nan and Grandad had met at the local ballroom. My wife’s Nan came from the area and her Grandad was stationed there with the army. They had moved to Guildford years before my wife’s mum was even born, and she had never been to Whitley Bay. As it was somewhere that her Nan and Aunties spoke of fondly, it was somewhere we always wanted to visit. The point of this last story is it doesn’t matter how much you spend on food. Sometimes, something simple with a great connection is all you need to create a great memory.